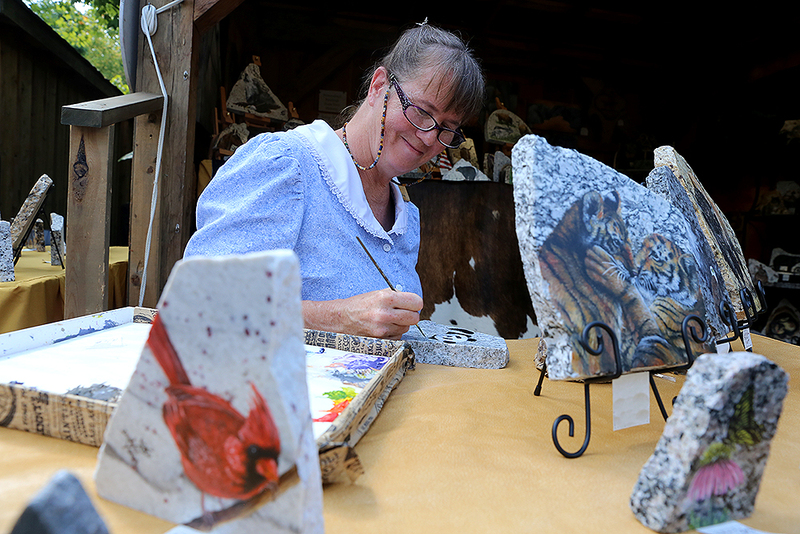 More than 125 visiting craftsmen from across the country are converging at Silver Dollar City this fall for the National Crafts & Cowboy Festival, which Travel & Leisure named The Best Fall Festival in Missouri. Presented By Humana®, the festival continues Wednesdays through Sundays through October 27. Every day of the festival includes demonstrations from these amazing artisans, who specialize in everything from woodworking and painting to blacksmithing and pottery. Often times, the stories behind these beautiful handcrafted treasures are as incredible as the crafts themselves. 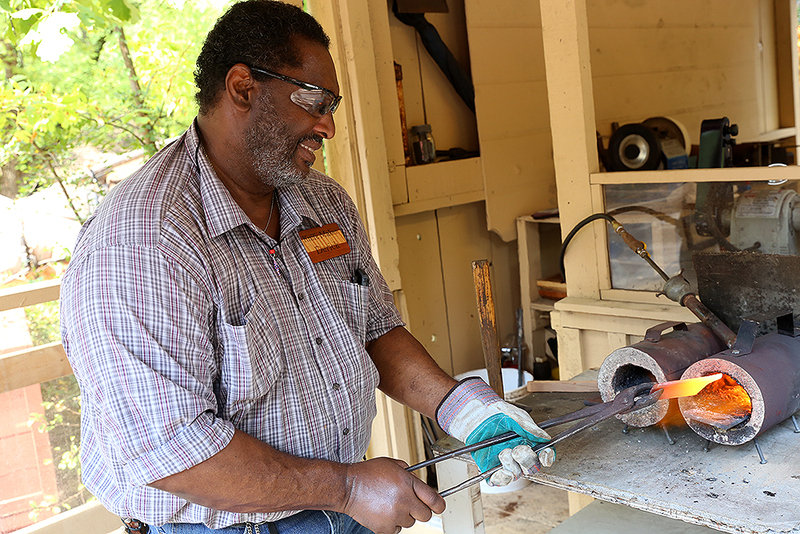 That’s why we at the Silver Dollar City Attractions blog are taking time each week to introduce you to some of the craftsmen who will only be appearing on park during this limited-time special event. If you missed our first two installments, click here to get caught up: Part 1 | Part 2. If you’re all caught up, continue reading and make plans to see these craftsmen before the festival ends October 27. Jackie and Gene Green live in Alton, Illinois, but spend their winters in Texas. 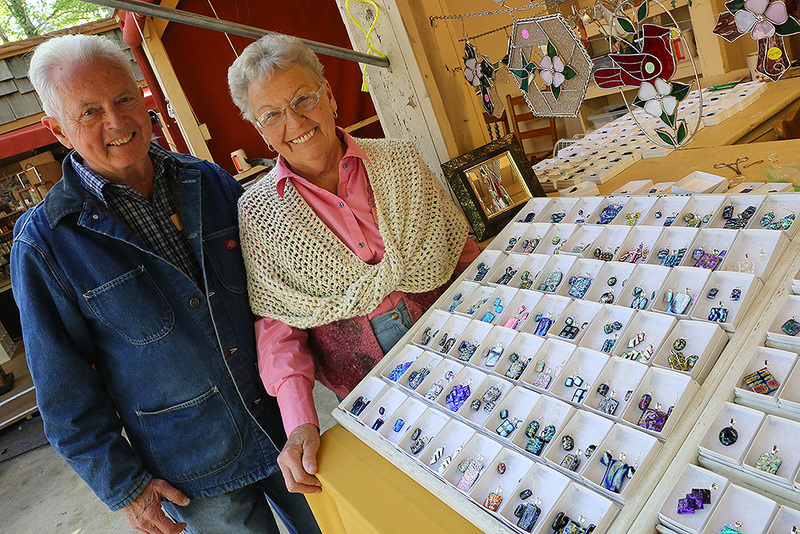 It was a visit to the Lone Star State that spurred their interest in dichroic glass jewelry. That was where they first saw a woman demonstrating the craft, which involves glass that changes colors under different lighting conditions. The Greens were amazed by the stunning, vibrant colors and unique style of the jewelry, and approached the woman about purchasing some of her creations. It’s not as easy as the Greens make it sound. After starting with a piece of dichroic glass, the Greens cut the glass into sizes that are appropriate for earrings and necklaces. Gene then lays a piece of clear glass atop the colorful glass and fires the two together in a kiln that slowly heats up to 1,500 degrees Fahrenheit. If the glass is heated or cooled too quickly, or the two glasses don’t function well together, the piece will be ruined. Another challenge the Greens encounter is making jewelry of a certain color. Though they may start with pink, purple or blue glass, it will change its appearance once it is heated in the kiln. They never truly know what color the jewelry will be until the firing is complete, roughly three hours after it starts. In addition to making jewelry, Jackie cuts stained glass pieces. Their stained glass teacher, Ken Dyer, assembles Jackie’s stained glass into beautiful nickel-plated displays. The Greens and Dyers currently share a booth on Hugo’s Hill Street near the Silver Dollar Saloon. The Greens will be on park through September 30, while Dyer will be here through October 27. When Derick Fisher visited the hospital for an illness in 2002, doctors gave him a grim diagnosis. If he hadn’t made it to the hospital that day, he likely would not have survived. “The doctors told me I had less than 24 hours,” Fisher recalled. The Warsaw, Missouri, resident faced a long road to recovery, but it was his journey along that road that introduced him to a pair of experienced knife makers. They first taught him how to make full-tang blades, then hidden tang-blades. From there, he learned to hand-forge his own blades and then learned how to forge Damascus steel, a complex method that places him a cut above other knife makers. While some knives are made with a single layer of steel, Damascus steel can feature as many as 240 or 480 layers heated in a furnace that can reach up to 3,000 degrees Fahrenheit. Fisher said this yields a tougher, stronger and denser knife that also features a unique design on every blade, the result of the process that forges multiple layers of steel into a single knife. “If you learn how to make Damascus steel, that sets you apart from a lot of people,” Fisher said. As Fisher got better and better at making knives, his teachers told him that he needed to start vending at local gun and knife shows. He visited one in Springfield, Missouri, more than 12 years ago and impressed a woman who asked for his business card. He didn’t know it at the time, but that woman was one of the potters who demonstrated at Silver Dollar City. She forwarded his information to park officials, and that led Fisher to becoming one of the demonstrating craftsmen at the park’s fall festival. Fisher will be on the Square until October 27. That statement reflects not only her artistic ability, but also describes what she does at Silver Dollar City. The Cassville, Missouri, resident does oil-on-granite artwork. She is painting rocks, and her work rocks. A self-taught artist, Woolhiser has been painting for more than 30 years. She recalled the day that a man brought her a milk crate full of small granite pieces that he no longer had a use for. She kept them for a couple years and never thought of using them in her artwork, until the idea suddenly dawned on her. “I feel like the inspiration came from Him,” she said, referring to the Lord. The pieces of granite in that milk crate quickly found new homes, so Woolhiser had to find more granite for her artwork. She will visit stores that sell cabinets and stone countertops, buy the biggest piece she can carry, take it home and drop it on the ground until it breaks. Then, she grabs a hammer and breaks it down into smaller pieces that are small enough to fit on a bookshelf, coffee table or mantle. The process makes her artwork unique. Photographers can print hundreds of 8x10 pictures. Artists can buy dozens of canvases of identical sizes. When you’re dealing with granite, every piece is going to be a different size and shape. “You get whatever comes up,” she laughed. An animal lover, Woolhiser paints all kinds of creatures. During a recent visit to her booth, she had giraffes, penguins, elephants, foxes, bluebirds, bears, owls, cardinals and more to choose from. After each painting dries, she sprays it with acrylic to preserve the artwork. One piece takes about three days. Woolhiser will be painting on the Silver Dollar City square through Oct. 27. A heavy construction worker by trade, Wendell Mills built things for his entire adult life. When he retired from his job, he couldn’t stop building. He doesn’t work on construction projects anymore, but now spends his days doing segmented woodturning. The craft involves taking 150 to 200 pieces of wood, cutting them with a table saw, shaping them with a lathe and gluing them together into a single component. Mills primarily focuses on vases, but also features some toys and home décor. “Every time it changes colors or directions, it’s a different piece of wood,” Mills explained. 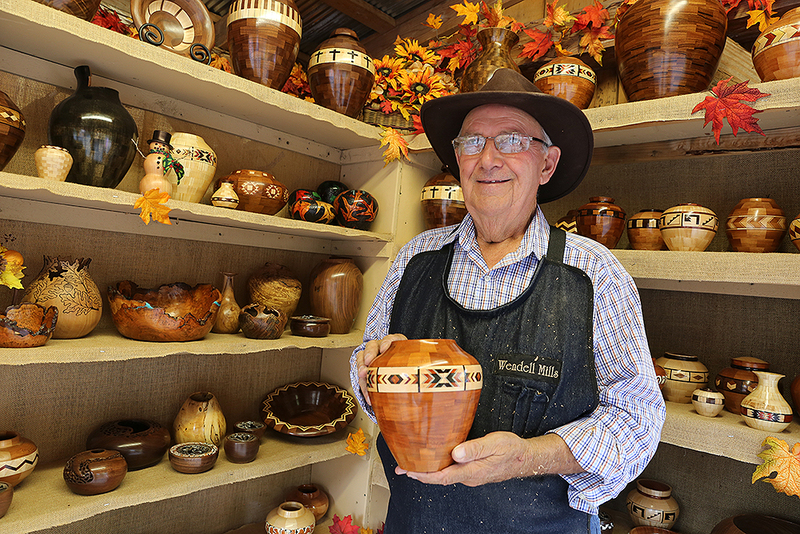 A resident of Sallisaw, Oklahoma, Mills is in his third year of demonstrating at Silver Dollar City. He’s been turning wood for about 10 years, teaching himself after seeing some photos of finished products. Working about six hours per day, it will take Mills about a week to a week and a half to finish one of his vases. He noted that once he glues a piece in place, he must wait for the glue to dry to proceed further. “What I like about it is the challenges of figuring out the different designs and patterns,” he said, gesturing toward his vases that are finished with religious, musical and Southwest styles. Mills is demonstrating on the Square through October 27.